April is always hot in Thailand — but this month has been like no other the country has known in recent history. Every day in April, the average peak temperature has been over 40C, with the maximum hitting 44.2C. The image above was created by NASA's Earth Observatory, produced using data from the Moderate Resolution Imaging Spectroradiometer aboard NASA's Terra and Aqua satellites. 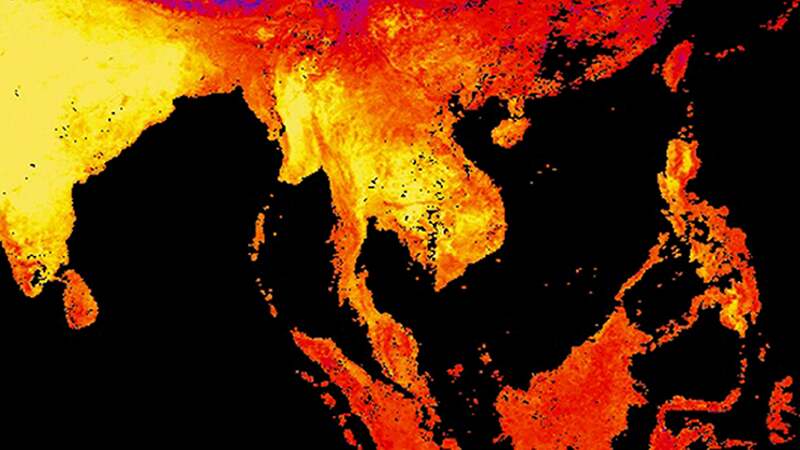 Yellow areas are the hottest, and you can see that Thailand in the middle is burning up. (As is India, but that's less unusual). The country's highest ever recorded temperature of 44.4C occurred in 1960. It's the most prolonged heatwave to have hit Thailand in the past 65 years. The government has issued health warnings — encouraging people to stay indoors, drink more water and take care to avoid food-related illnesses — as the temperatures are likely to continue.